MATV stands for Master Antenna Television. 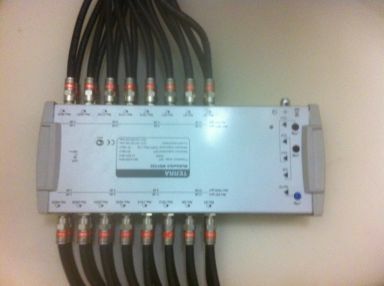 It is the means by which many apartment houses hotels, schools and other multi-unit buildings distribute TV and FM signals to a number of receivers. In order to accomplish this without a loss of signal quality, these systems must be carefully planned and engineered through the effective use of MATV equipment and techniques. An MATV system is basically a network of cables and specially designed components that process and amplify TV and FM signals and distribute them from one central location . If there were 100 TV sets in a building, it would be extremely expensive to Install and maintain l00 separate antennas. Not only would It be unsightly, but reception would suffer because that many antennas would interact with each other, causing interference problems. A mass of commercial premises including hotels, offices, housing developments and holiday parks, now utilise some form of structured cable system to supply an array of different programmes and information services to their end-user customers. A modern MATV system can carry analogue and digital television signals through an aerial, both free-to-view and subscription, FM radio and DAB (Digital Audio Broadcasting) but it cannot carry satellite signals. Some MATV systems in use today are over 30-years old and the many are unsuitable for carrying digital television signals. These will need to be surveyed and may require modification or replacement. The aerial is a conventional digital aerial, receiving digital TV signals. Signals received by the aerial are then processed. In systems that have not been modified to carry digital, it is usually this processing that restricts or prevents the digital signals from being handled correctly, as the processors are only designed to handle analogue TV signals. A distribution network then delivers all television signals to a socket outlet in each household. There can be more than one outlet per household, but only one TV set can be connected to each outlet. How the distribution network is configured will depend on the number of dwellings and floors in the building. Melbourne Antenna Services are experienced in installing and maintaining MATV systems. We have installed major projects for commercial clients across Victoria. Melbourne Antenna Services can provide the solution to your installation requirements. Contact us today to discuss the supply, installation and Maintenance of commercial MATV systems.